Canadian rock mainstay The Tragically Hip held what will likely be its final concert this weekend, finishing the Man Machine Poem Tour that kicked off with the announcement that lead singer Gord Downie had been diagnosed with incurable brain cancer earlier this year. The sold-out show was streamed on the CBC for the benefit of those who couldn’t get tickets, but at least one high-profile fan was definitely in Kingston Saturday night: Canadian prime minister Justin Trudeau. Trudeau—who’s built a reputation for himself as the “Cool Principal” of world leaders —saluted the band during the concert, noting his “mixed feelings” at seeing them finish on such a celebrated high note. 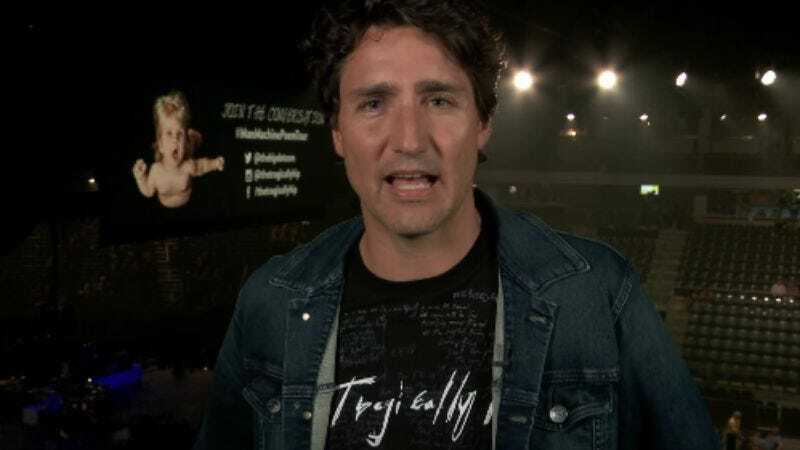 Clad in his ceremonial jean jacket and Tragically Hip concert T, Trudeau praised the prolific rock group for its long, successful career, which saw them earn international recognition while still remaining “anchored in Canada, in so many ways.” Trudeau followed up his appearance with a series of tweets, thanking Downie and the band for more than 30 years of music.